Looks like Zomato don’t want you to go out of your home to eat. Order food online and enjoy IPL matches while having a feast. Zomato has plenty of offers going on different different payment modes like 50% cashback on Paytm and many more. Here is another offer. Get flat 40% cashback (up to Rs 75) on food orders paid via Lazypay. Best part of this offer is that you need not to apply any promo code to avail this deal i.e. you can apply a promo code that you want and then on top of that pay via Lazypay to get additional 40% cashback. So, hurry and order now. If you are a new user, you can get flat 50% off on your food order and then you can pay with Lazypay to get another 40% cashback. How to get flat 40% cashback (up to Rs 75) on food orders paid via Lazypay? This festive season, order food from your favorite restaurant on Zomato and pay just half the price. Yes, your heard it right. Zomato is offering 50% off (up to Rs 150) on 5 self pickup orders. Order now & pickup your food. Enjoy discounted food this weekend. How to get 50% off (up to Rs 150) on 5 self pickup orders? Own a SBI Credit Card? Zomato has come up with a partnership with SBI Bank wherein all SBI Credit Card customers can get 50% off (upto Rs 100) on Zomato Orders. Offer can be used 3 times in the offer period. So, order now and enjoy food from your favorite restaurant at great discount. 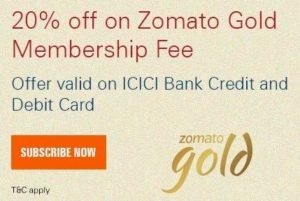 How to get 50% off (upto Rs 100) on Zomato Orders? Zomato has again come up with early bird offer for food deliveries in partnership with Paytm. After rocking with EVE40, now get flat 30% cashback (up to Rs 100) on food orders before 7 PM when paid with Paytm. So, order now. How to Get flat 30% cashback (up to Rs 100) on food orders before 7 PM?